What foods an individual eats is affected by the ability to access foods. Economic status, geography, and politics have influenced the diets of people throughout history. Poverty is linked to malnutrition , while economic growth and a rise in population pose new nutritional problems. Ironically, diets high in complex carbohydrates and fiber in poor economic times give way to consumption of foods high in sugars and fat when economic conditions improve. Between 1995 and 1997, among countries that showed an increase in per capita incomes, average caloric consumption also showed a significant increase. Between 1970 and 1972, and between 1996 and 1997, world consumption of calories from complex carbohydrates fell by 30 percent while the consumption of calories from meat increased by a third (33%) and those from vegetable oil by almost half (46.2%). As nations become wealthier, people move from eating "a poor man's diet " of high levels of grains, fruits, and vegetables to consuming diets with more fats and sugar. Fat still remains the food for the rich—with more income, people start to eat more meat and poultry, and vegetable oils become more available. Combined with cane and corn sugars, vegetable oils are used to produce baked goods and snack foods high in calories. 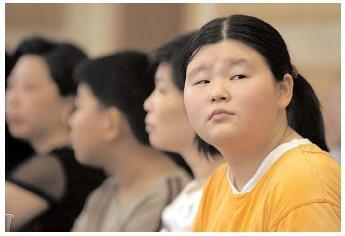 Young Chinese attend a weight-loss lecture in Shanghai. A trend toward obesity in many nations is accompanied by obsession over body image. During 2002, several citizens of Asian nations died and hundreds were sickened when they took a popular diet pill that was known to cause health problems. Toward the end of the twentieth century, economic growth among developing countries caused the phenomenon of the Westernization of traditional eating patterns. Industrialization and modern transportation brought baking technology and Western food styles to developing countries. New and tasty foods high in fat, sugar, and salt became the choice of the new rich. Trendy fast foods, soft drinks, and meat products replaced traditional ethnic foods. Fortunately, in many emerging societies the poor are still unable to afford Western fast foods, and are thus spared the ills of high consumption of fats, meat, and sugars. For example, many people in India still spend more than half their income on food consumed at home, compared to the average American, who spends less than 8 percent of his or her disposable income on home-cooked food. The American diet, much like that of many industrialized nations, derives its calories from fats, sugars, and animal products in foods prepared or processed away from home. One out of every three meals in America is consumed away from home. From 1990 to 2000 there was a 14 percent decrease in the number of meals eaten at home. In 1977 only 16 percent of all meals and snacks were eaten way from home. By 1995, this rose to 27 percent. In 1995, away-from-home foods provided 34 percent of total caloric intake, an increase from 18 percent in 1977. In addition, eating at home does not always mean cooking. Supermarkets and grocery stores provide thousands of ready-made meals, frozen foods, and processed meals that require little preparation at home. Total fat consumption in the United States increased from 18 percent in 1977 to 38 percent in 1995. According to Lin and Frazao, away-from-home foods deliver more calories in fat and saturated fat and are lower in fiber and calcium than home-cooked foods. The average total calories consumed by Americans rose from 1,807 calories in 1987 to 2,043 calories in 1995. Since away-from-home foods deliver more fat and more calories, the trend of eating out can become a health hazard. People tend to eat more from restaurants and fast-food places because many eating establishments "supersize" their portions. Customers feel that they get their money's worth when they receive more food than they need. Childhood and adulthood obesity are on the rise. Between 1988 and 1994, 11 percent of U.S. children and adolescents aged six to nine years of age were overweight or obese . During this same period, 35 percent of the American adult population aged twenty and over were obese, compared to 25 percent during the years 1976 through 1980. The rising trend in obesity pervades the Middle East, the Caribbean, Europe, Latin America, Brazil, Japan, South East Asia, Australia, and China. Since being overweight is associated directly with many chronic illnesses, such as heart disease , hypertension , hyperlipidemia , cancer , stroke , and type II diabetes , an increase in the incidence of overweight and obesity is a serious concern. The top three leading causes of death in the United States during the 1990s were heart disease, cancer, and stroke. Diabetes ranked seventh in 1997—it was not even in the top ten in 1987. The U.S. Surgeon General reported in 1998 that type II diabetes, an adult health problem related to obesity, was being seen in children as young as four years old. Diabetes among adults increased by 70 percent between 1990 and 1998 among individuals 30 to 39 years of age; by 41 percent among individuals 40 to 49; and by 31 percent among those 50 to 59. By 1998, 16 million American adults suffered from diabetes. In addition to the health threat, obesity can cause emotional pain due to social stigmatization, discrimination, and lowered self-esteem. In 2000, the World Health Organization estimated that there are 1.2 billion obese individuals around the world. The increase in the number of fast-food restaurants, supermarkets, and restaurants in developing countries, and the rising trend of eating meals away from home, present a global challenge to ensure that food is appealing and safe. Many countries have agencies that set and regulate standards for food safety. In the United States, the U.S. Department of Agriculture (USDA) has the task of regulating and inspecting meats and poultry during slaughter and processing, while the Food and Drug Administration (FDA) is responsible for conducting tests, setting standards, and enforcing laws regulating food quality and processing. FDA inspectors check restaurants to make sure that they practice food safety regulations. FDA officials also review the safety of chemicals that manufacturers use as food additives . Importing foods from countries where food safety is not strictly monitored presents a global health threat. The biggest problem with food safety is food poisoning . Some bacteria and viruses that cause food poisoning are: Escherichia coli, Salmonella, Listeria monocytogenes, Shigella, Campylobacter, and yersinia. Bacteria, viruses, toxins , parasites , and chemical contaminants can all cause food-borne illnesses, and it takes only a small amount of contaminated food to cause severe food illnesses. 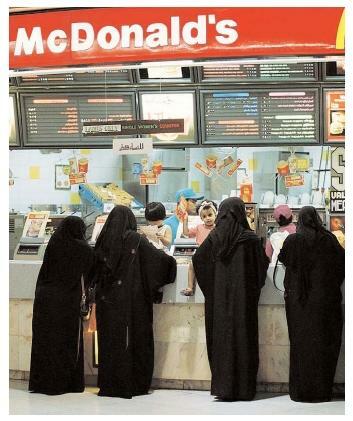 Abaya-wearing women in Saudi Arabia wait in the ladies-only line to order a quick meal. In developing nations, the popularity of fast-food alternatives to traditional cuisines has prompted debate over the nutritional and cultural impacts of Westernization. Signs and symptoms of food-borne illness may present within thirty minutes of eating contaminated food, or they may not show up for up to three weeks. While some food-borne illnesses may last for a couple of days, some may last for weeks. Severe cases can be life threatening. SEE ALSO Convenience Foods ; Fast Foods ; Obesity . Centers for Disease Control and Prevention (1997). "Update: Prevalence of Over-weight Among Children, Adolescents, and Adults—United States, 1988–1994." Mortality and Morbidity Weekly Report 46:199–202. Lin, B. H., and Frazao, E. (1977). "The Nutritional Quality of Foods at and Away from Home." Food Review 20:33–40.